Linkedin (Ullord Translates as Orchard) to undertake the aims of the website. Ireland may have its second major housing and land boom. Housing development, real estate and national housing is a challenging subject , and in Ireland following the end of the banking inquiry (28.01.2016 Volume 1 & Volume 2 and see the following film “the Big Short” who profited from betting against the market) the consensus from the inquiry is the banking collapse was unnecessary, it was predictable in advance and resultant measures to address it are still being worked out and decided. Ireland from 2009 is to pay its debts until 2046 due to the mismanagement of the economy and future political parties have not as yet suggested how they will pay for the future needs of the country. For people who purchased a home aside from the negative equity concerns there were also technical housing issues which are connected to finance, but if they are corrected they do not have to prevent a new housing boom, preventing a second collapse. Development is changing in housing and land. One of the problems concerned the design of the buildings described as a revolution in Ireland (i.e. you could have any colour you like as long as it is beige) This translates as the requirement to fulfill the mortgage or banking side of the act of purchasing a house. In other words they became standardised but predictable for finance purposes encouraging replication without building or construction care, until they were built too quickly and without attention as profits increased. Many new builds fell down (can they be bulldozed or can they be saved) or subsided after 3 or 4 years. 1. A significant factor in the poor construction of the buildings is the quality control. Usually a neutral person (who in effect works for the bank) but who advises the client (developer) and customer (mortgagee) checks the building as it rises from the foundations upwards until it is complete. Often an architect should not do this alone as if it is found to a bad build then the customer cannot afford to legally address the rectification of the problem which can go on for years. Putting pressure on all them is a local authority building control person who also checks. This dynamic produces a better built house or commercial building. Without it the result is standardised badly built buildings. 2. The other side of the coin is the socialised (socialist / communist) approach to buildings which produce the same problem as only having a building control person who is not subject to market pressures, the system over years can stagnate. In socialist countries they also fell down and suffered a lack of investment and became unlivable. Of course it is not the integrity of any of the persons named above in question but the system and lack of controls. A mortgaged funding model faces competition from socialised building, yet often local politics and national politics (all levels) are represented by people who claim to the voice of the working class, yet it is not written in stone that they are ? and you can test if they are (or what they are) by asking how they intend to fund projects and what proof of their intent do they have for the electorate. If the socialised build simply adds to the national debt and their resultant increased taxes then in effect the borrowing is similar to the bonds which are mortgaged debt. 3. One further method of financing is to build slowly from wages and savings and hope your country allows inheritance laws to be void of tax, so that families and communities can continue and homes become a village over time. 4. Again and in-between all 3 methods of the above is building without borrowing within the national internal economy. This method allows a housing estate or small village to be owned by everyone and its gross cost is either A) added to the national debt and never repaid set against the asset of the new build and accounted as balanced or a smaller outstanding balance is left to fulfil wages. Rents and selling can then reduce the balance to nil. or B) Paid off like A without interest accruing. All four of these methods and variants on them including 4 A & B have been tried and tested in nearly every country on earth over many hundreds of years. It is not “free” but is repaid by real estate and loan but is useful in building and planning. It is obvious that all finance solutions have run into problems but well built buildings defy inflation if they remain standing in good condition. Mortgages have run into problems (the sub – prime problem as the film the big short displays above) but if a country had 100% employment usually aided by manufacturing or intensive labour industries (such as locally produced energy solutions) and more MO in the MO to M4 money stock (money supply where MO can also be a bond and not just coins and notes) then the mortgage system could go on forever into a mega boom (without the bust) that would make previous wall street booms look like an afternoon tea party, and would also give people the choice (which takes default pressure off the market). The combined wages of people checking quality control, and a 4 – 6 % loss is mortgage sales (subprime) is a drop in the ocean since 2008, it would not be noticed and the resultant extended boom would make more than the loss which is not a loss as such as the business caused more trouble than it was worth. And in Germany Passive Hus (Passive Houses see next paragraph) is checked in stages before mortgage money is realised (without slowing anything down for developers or local councils) and checked to 10 times a higher standard than most parts of Europe, and local authority grants are added and % discounts for green energy saving features and design. This way a family or local community can inherit, or people can speculate on property if they wish. Some housing developments did not include energy concerns in their designs (such as Passive Hus airtight design ), they did not include or consider shops, or a creche or social needs or work travel needs. Many countries see this requirement as one half of the construction process which should be married to the financing plans. The other concern in building construction is the aesthetics. Standardised buildings lost their character and appeal. When the aesthetic aspect of design and build is considered and applied to the construction build project, costs can escalate. Finding solutions to this problem of the cost of land, design and the build has not produced a long term solution to the problem. Landscaping and sustainable development is seen as one solution which can solve these dilemmas. Town and area planning in some countries considers the natural surroundings first, taking designs to compliment nature. In modern countries allowing natural foliage and nature to to grow and emerge in urban areas which can co-exist with homes may mean waiting up to 4 or 10 years for wasteland and common areas which are polluted and industrial to bloom again. Planting fruit and berry trees of all descriptions sizes and shapes producing delicious food, has been a great success in many urban areas hundreds of thousands of trees, providing food, wildlife and diversity. Also they look good instead of the plain evergreen shrubs and bushes, and trees which are made to order, grow everywhere and have to be pruned and managed but produce very little and are in effect pointless. Why wild flowers and tall grass and berries are sprayed with pesticides and chemicals or are cut away from urban areas without need is a mystery as they look well and manage themselves 85 %of the time. Chemical spraying is also harming wildlife, people, food and the water table.These ideas are the last thing to be considered in urban or rural design ? Apple trees are a good example of natural growing trees which provide food and diversity. One other method is to plan them into housing, estate and urban design from the beginning (and this is also successful in new planning ideas) as well as planting every existing street and avenue with fruit and berry trees, instead of just having vast urban highways full of traffic and concrete.Every pavement and footpath could have them. Oaks are also beneficial for diversity and should be planted everywhere in vast quantities. 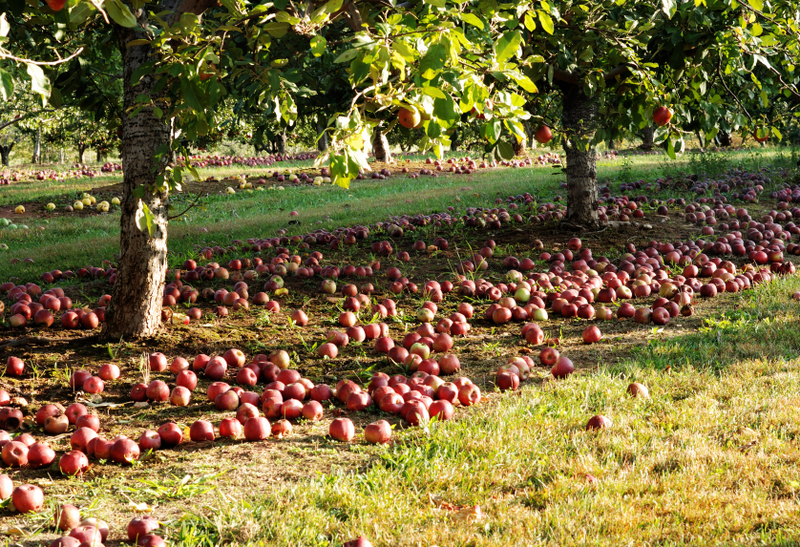 Orchards and other fruit producing ranges, can produce fruit (apples, pears, or berries most of the year round. There are hundreds of varieties. It is a compliment to housing design and sustainability requirements also.Further you can invest in the planting and harvesting of any fruit for local markets which over many years (like producing energy from home and selling it into the national grid) produces an income if you or communities owned the tree or thousands of them and co-operatives can assist this idea. Local authorities can plant many types of fruit trees if they were a part of national planning. In 5 – 15 years you could transform every town and therefore every country without too much redesign or effort.Homes have connecting streets and path and gardens and fruit trees are low mainatinaence. Ullord means Orchard and simply incorporating these idea’s as one idea into design, changes how we design homes and the space they sit within. Avalon was described as the Isles of Apples, not as a wasteland. Other benefits of apple trees are of course cider and increases in wildflowers means more Bees and of course mead (which has medicinal qualities and many uses) and honey. Without Bees and pollination many crops would cease to exist and the world will starve. It is a serious poroblem which is not addressed as yet. Orchards were planted to maintain diversity and of course they are aesthetic. Corrections to the financing and making cities a pleasant place to live is a major part of peoples lives. These views whilst seem relatively simple and almost too simple to be of any use yet it is the difference to building on sand or building on rock. However small as issues they seem they are never introduced into planning ? Considering nature first and then designing buildings to compliment nature is not a current planning practice in effect only a consideration. Sustainable development and Corporate Social Responsibility (CSR) is now in every planning directive worldwide but not much has changed in construction. Financing these new practices currently is difficult and slow due to a lack of expertise,(green technology and risk with housing and green planning) but overall any new housing boom could produce a new era of superb design. They were planted everywhere once and as landscaping plants the standard “filler” varieties then the cost will be the same, and they will help alleviate food security, pollution problems, chemical spraying in urban and country areas and they are pleasant. They can be planned into every new garden and urban area and existing such as the following examples. (city rood top, garden city rooftop and here Homes will therefore follow on and this philosophy will change homes and real estate everywhere. The images on this page are described in the information tab in red below (website images information link) or here giving the relevant reason they are chosen. For example stained glass such as art nouveau is considered one of the finest design features of the modern era. When it is added to every house or building you see it in, is attractive and brings the light into your home. A famous and incredible example of this is Chartres Cathedral built by the Templars in France (for example) has stained glass within it and to this day they are unsure how it was made, especially the blue glass which is deeper and richer than any previous stained glass examples, its hidden design secret. is considered here. The effect is astonishing. Light in building design is also third or fourth along in many designs The rest of the images are described/located as mentioned above. When you look at some town, city and housing designs which reflect the culture of the country you are in and think a child could have designed it better then get involved with local planning.